Comvita Winter Wellness Manuka Honey Elixir with Propolis is an all-in-one immune support formula, providing zinc which contributes to the normal function of the immune system. Peppermint oil supports healthy airways and Propolis contains high levels of bioflavonoids. New Zealand UMF grade Manuka Honey is highly regarded and its reputation continues to grow. Comvita Manuka Honey is sourced from New Zealand`s remote, pollution free native forests and is world renowned for its unique flavour. Comvita Manuka Honeys for both the table and the first aid cabinet are tested for the unique antibacterial properties which make New Zealand Manuka Honey famous. The Active Manuka Honey Association (or AMHA), has registered UMF as a trademark so that the antibacterial activity of Manuka Honey cannot be misrepresented. The UMF number comes from a laboratory test for antibacterial activity, with the honey being compared with a standard reference antiseptic (phenol) for potency. UMF 20+ would be equivalent in antiseptic potency to a 20% solution of phenol. Comvita Propolis comes from unspoilt areas of New Zealand where deciduous trees produce resin to protect their young buds and exposed areas. Honeybees gather the resin on their back legs and carry it to the hive where they mix it with beeswax and enzymes to make Propolis. Propolis sterilises and seals the hive, protecting it from bacterial, viral and fungal infections. Thus Propolis is known as nature`s best defence. Propolis is rich in a certain group of antioxidants called flavonoids (also known as bioflavonoids). Flavonoids are powerful, free-radical scavengers that give strong support to the human body`s natural immune system at the cellular level and assist with cell regeneration. Multiflora Honey, Apple (Malus spp) Cider Vinegar, Water, Manuka (Leptospermum scoparium) Honey, Peppermint (mentha piperita) Oil, Propolis powder (contains anticaking agents [calcium phosphate and silicon dioxide]) Carrageenan (thickener) (contains bulking agent [dextrose]), Eucalyptus (Eucalyptus globulus) Oil, Xanthan Gum (thickener), Tea Tree (Melaleuca alternifolia) Oil, Fennel (Foeniculum vulgare) Oil. Adults: Take 10ml (two teaspoonfuls) every 2 - 3 hours. Take up to 40ml daily. Children over 2 years: Take 5ml (one teaspoon) 2 - 3 hours as required. Take up to 20ml daily. To retain the integrity of this product please store below 30°C. Propolis may cause severe allergic reactions. If irritation or swelling of the mouth or throat occurs, discontinue use and seek medical advice immediately. 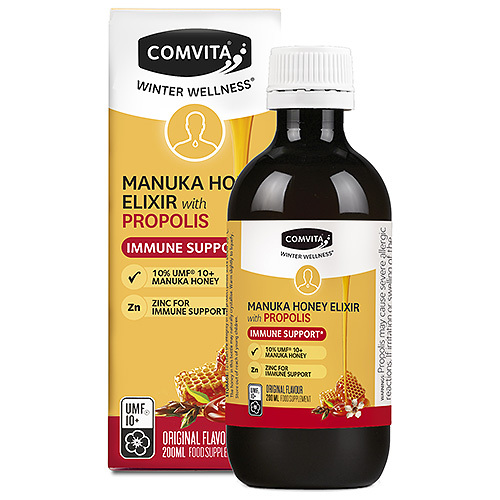 Below are reviews of Comvita Winter Wellness - Manuka Honey Elixir - 200ml by bodykind customers. If you have tried this product we'd love to hear what you think so please leave a review.